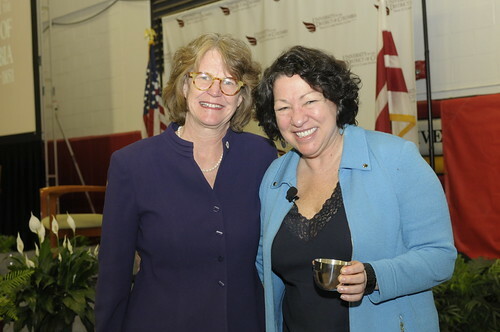 The Honorable Sonia Sotomayor, Associate Justice, Supreme Court of the United States, participated in the 20th Annual Joseph L. Rauh, Jr. Lecture: a Conversation with Justice Sotomayor. Dr. Allen L. Sessoms, President of the University of the District of Columbia, Michael Rauh, Chair of the DC School of Law Foundation, and Dean Shelley Broderick all gave welcoming remarks. A short video of Justice Sonia Sotomayor presiding over a trial between two Muppets on Sesame Street started the program which was attended by 1400 students, faculty, staff, alumni and friends of the School of Law. In lieu of a formal lecture, Wade Henderson, President and CEO of The Leadership Conference on Civil and Human Rights and the Joseph L. Rauh, Jr. 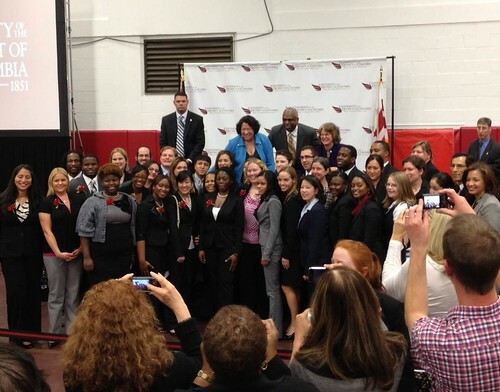 Chair of Public Interest Law at UDC-DCSL, interviewed Justice Sotomayor. Professor Henderson inquired about her years as a prosecutor, U.S. District Court Judge, Judge on the U.S. Second Circuit Court of Appeals, and Justice on the U.S. Supreme Court. Justice Sotomayor also described her family and childhood in the Bronx, and what inspired her to become a lawyer and prosecutor. After the conversation, Dean Broderick presented the Justice with the Dean's Cup. 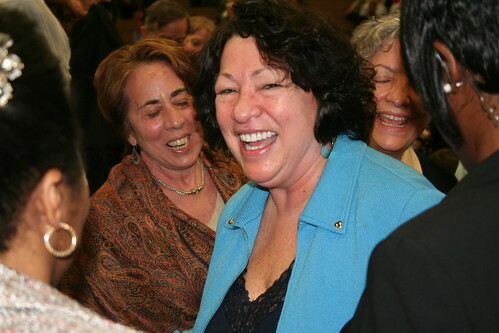 When Justice Sotomayor first appeared on stage, she was greeted by a spontaneous standing ovation by the joyful crowd. After the formal program, the Justice literally kicked off her shoes and climbed into the bleachers in a dozen different locations to greet and to take photographs with those in attendance. The crowd was amazed and thrilled with her warm and wonderful return of their support and affection! There were a handful of photos taken using cellphone cameras that were poor quality. Everything else we have collected is available on Flickr. The photographer took more pictures. But the photos displayed seem to be only a few. Are the other photos available and shared to the members. Why are those being restricted and not available? I thoroughly enjoyed the conversation with the Honorable Judge Sotomayor. Not onlly was it insightful into the life of the Supreme Court Justices but it also allowed us to see the very human and humoristic side of her endearing persona. She is indeed a great role model fo be emmulated by girls, women, HIspanics and other minorities as well. Where there is a will, there is a way! And she is certainly living proof of this addage. Thanks to the UDC Law School for bringing her so close to us and thank you Judge Sotomayor for taking the time from your busy schedule to talk to us!